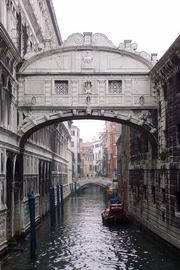 Study the information about Bridge of Sighs in Italy. Learn its location and main attractions. The Bridge of Sighs was erected in 1600 to connect the famous Doge's Palace (Palazzo Ducale) to the notorious Doge's Prison on the other side of the Rio di Palazzo canal and therefore it is not itself a prison. Ponte de Sospiri earned its tremendous name during the 19th century when Britain's Lord Byron waxed poetic upon hearing the sighs of predestined prisoners en route to the executioner. 90-minute Secret Itinerary (Itinerari Segreti) tour (conducted in Italian) traces their condemned footsteps to the cells, torture chambers and other hideaways deep in the bowels of the prison.